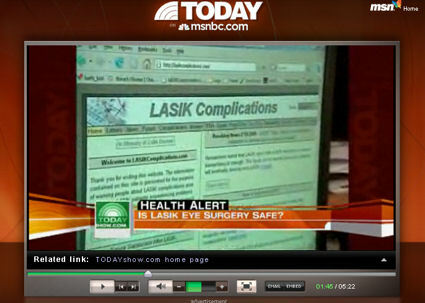 LASIK Videos and News Reports: Fox, CBS, ABC, NBC, CNN, and more. Investigators go undercover to expose the lies that LASIK clinic staff tell prospective patients. Former FDA chief, turned whistleblower, Morris Waxler, PhD, exposes the dirty secrets of LASIK clinical trials and the egregious FDA approval of LASIK devices. Young mother talks about suffering from painful, chronic dry eyes after LASIK. Son of police officer who took his own life due to LASIK complications speaks publicly for the first time. Dr. Stephen Slade: "As ophthalmologists these are all our patients that have had problems with LASIK... We can treat the cornea with medications when it has ectasia..."
Editor's note: Dr. Slade said he is committed to helping patients with bad outcomes from LASIK. So, we can't help but wonder why Dr. Slade hires himself out as a defense expert witness against patients who are victims of LASIK malpractice. See Dr. Waxler's petition on regulations.gov. Enter Keyword or ID: FDA-2011-P-0022, and then click Search. You can leave a comment in support of Dr. Waxler's petition by clicking "Submit a Comment" next to the word balloon.